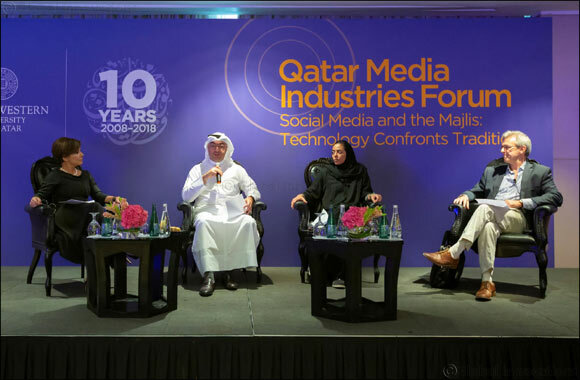 Doha, Qatar – October 30th, 2018 – How the traditional majlis in Qatar and the Gulf region is influenced by social media was explored and analyzed by a panel of communication experts during a session of the Qatar Media Industries Forum on Monday. The forum, convened twice annually by Northwestern University in Qatar, reported that the Majlis, long the most important source of communication in Qatari society, is alive and well, but greatly enhanced and made more cosmopolitan by the use of social media thus shaping discourse at the family, community, social, and political level – and provided clues as to how this key feature of public life, and its influence, will evolve in the future. The panel, moderated by Banu Akdenzili of NU-Q, agreed that the Majlis is changing and in different ways. Weighing in with striking examples and data were panelist business leader Mohamed Jaidah, owner of 60 Degrees and group executive director at Jaidah Group; Manar Al-Muraikhi, director of community and public relations at Ooredoo; and Gulf expert Gerd Nonneman, professor and former dean at Georgetown University in Qatar. Jaidah is also a founding member of QMIF. QMIF provides media leaders in the Arab Region with a platform to explore topics of critical importance to Qatar’s emerging media and communication industries. Each year, Northwestern University in Qatar hosts forums bringing industry leaders together to exchange ideas, advice, and experiences across a broad range of topics, that have included media consumption in the Arab World, mapping Qatar’s media market, and meeting the demand for regional content. “The Forum offered a cutting-edge perspective combining a respect for the tradition of the Majlis with the added influence of social media,” said Everette E. Dennis NU-Q’s dean and CEO who has convened the QMIF since 2012. “While most majlises are for men, there has also been a rise of the female majlis as well. One panelist noted that some family majlises include both men and women. “Given the central influence of the Majlis in Qatari society, considering the forces that influence opinion and inform decision-making in such settings, has widespread implications for media organizations, decision-makers, and officials as well as brands and businesses,” NU-Q’s Akdenzili noted. During the broad-ranging discussion, the panelists described the positive and detrimental impact of technological advances and widespread use of social media on majlis interaction. There was broad agreement that media sources have always influenced the content of discussion in majlises, but that social media had broadened discourse and led to a widening of perspectives. Nonneman argued that there are many types of majlises across the region ranging from some organized by families and community groups to others that are quasi-governmental entities, cautioning against too much generalization. The panelists also acknowledged the willingness of people to speak more openly and frankly in private, face-to-face settings. “A majlis is a positive and private place where I feel comfortable and can share ideas. Digital media is a platform where we can discuss many things, and a person might feel more comfortable confronting someone from behind the scenes,” Al-Muraikhi said.